Any other reports of decade change problems? We are curious whether anyone else is seeing the sorts of issues like the one with Symantec we just reported. Have you seen problems with the change from 200* to 20**? UPDATE 1: Johannes mentioned that DShield actually had problems due to a regex on incoming logs looking for 200[0-9], to prevent ridiculously future dates being sent in. He ended up fixing it early in the morning on Jan 1. Anyone else have stories to share? UPDATE 2: We've had two interesting issues pointed out. UPDATE 3: Splunk has released an update to fix the parsing issue for the date/timestamps that use a two character year (such as 09 or 10 for 2009 and 2010 respectively) that fix the datetime.xml. Additional information available here. Arcsight - Perpetual license keys received before December 1st, 2007 still show a license expiration date of January 1st, 2010, in the ESM v4.0.x and v3.5.x Console. While the January 1st, 2010 expiration date is not enforced for perpetual licenses by the product, it has caused concerns and confusion. Customers who have upgraded to ESM v4.5.1.0 or v4.5.1.3 have encountered issues where their console connections have been rejected. Thanks to Derek to pointed us at this post from Symantec: http://www.symantec.com/connect/forums/official-status-sepm-definitions-stay-31-12-2009-last-updated-04-jan-2010 stating that Symantec Endpoint Protection Manager considers any definition update with a date newer than 11:59PM December 31 2009 will be considered out of date. They say they are working on a fix but are currently handling this by releasing new definitions with higher version numbers but the same date. Now comes the interesting part. This is an egg-hunting shellcode: it starts at the memory address ((0x02020200 OR 0xFF) + 0x01) = 0x02020300) and compares content of every 4 bytes with 0x58905090. 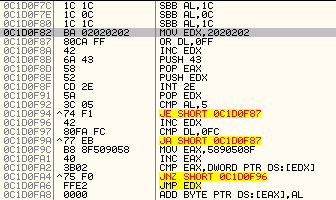 You can see that initially the attacker moves 0x5890508F into the EAX register, which then gets increased by one – this was probably done to evade detection. This pattern (0x58905090) corresponds to instructions POP EAX, NOP, PUSH EAX, NOP. Now, once this pattern has been identified in memory, the egg-hunting shellcode passes execution to this, second stage shellcode. The fact that the decompression fails does not matter – Adobe Reader will open the whole document (mmap it) into memory, including this "corrupted" object so the first stage shellcode will be able to find it and pass execution to it! The binary is XORed with value of 0x85 so the first two highlighted bytes are actually MZ, which is where the executable starts. The second binary (temp.exe, 980e40cacbc9f898bc08cb453fa2d6bb) was even more surprising. This binary drops a benign PDF document on the machine, called baby.pdf. This PDF document is then opened with Adobe Reader – it just shows a table and, according to the metadata in the document, has been built from an Excel document. This was done by the attackers to make the victim believe as if nothing happened, because the original exploit will crash Adobe Reader and this might make the victim suspicious about what happened. Additionally, the PDF document contains everything it needs to fully exploit the victim's machine – it does not have to download anything off the net. Not only was this a very interesting example of a malicious PDF document carrying a sophisticated "war head", but it also showed the length attackers are willing to go to in order to make their malware as hard to detect as possible, not only for the AV vendors, but also for victims. If we are to judge the new year by sophistication the attackers started using, it does not look too good.